As many of our readers follow the Madhya Pradesh news religiously, we present the latest Madhya Pradesh news for those of you who avidly follow emerging news from Madhya Pradesh updated to the minute. Do send us a feedback on the quality of Madhya Pradesh related news served to you, so that we can make it better for you. Bhopal, April 23 (IANS) Bharatiya Janata Partys (BJP) Lok Sabha candidate from Bhopal, Sadhvi Pragya Singh Thakur, submitted her nomination on Tuesday. View More..
(Attn Editors: This is the second and concluding part of a two part series on the churning in the erstwhile Bhopal royal family over the claimants to thousands of acres of land worth crores of rupees. Part II examines how the dispute has moved forward. Part I, which ran on Monday, examined the genesis of the dispute and the dramatis personae involved. Editor IANS) View More..
Bhopal, April 23 (IANS) Sadhvi Pragya Singh Thakur on Tuesday filed another set of nomination papers as a BJP candidate from Bhopal. She had earlier filed her papers on Monday, claiming that it was an auspicious mahurat. View More..
Bhopal, April 22 (IANS) Refusing to accept her explanation regarding controversial comments about the Babri Masjid demolition, the Election Commission (EC) on Monday ordered registering an FIR against BJP candidate from Bhopal Sadhvi Pragya Singh Thakur for violating the model code of conduct. View More..
(Attn Editors: This is the first of a two part series on the churning in the erstwhile Bhopal royal family over the claimants to thousands of acres of land worth crores of rupees. Part I examines the genesis to the dispute and the dramatis personae involved. Part II to be carried on Tuesday will examine how the dispute has moved forward. Editor IANS) View More..
Bhopal, April 22 (IANS) Announcing its support to Congress candidate and former Madhya Pradesh Chief Minister Digvijaya Singh, the Communist Party of India (CPI) on Monday announced it will not field its candidate from Bhopal for the Lok Sabha elections. View More..
Bhopal, April 21 (IANS) The Election Commission on Sunday issued a show cause notice to Sadhvi Pragya Thakur, the BJP candidate from Bhopal, for her controversial remarks about the Babri Masjid demolition. View More..
Bhopal, April 21 (IANS) Bharatiya Janata Party (BJP) candidate from the Bhopal parliamentary consituency in Madhya Pradesh Sadhvi Pragya Thakur said on Sunday that she takes pride in the demolition of the Babri Masjid. View More..
Shivpuri (Madhya Pradesh), April 21 (IANS) Congress' Guna candidate Jyotiraditya Scindia, who belongs to the erstwhile Gwalior princely dynasty, owns properties worth over Rs 2 billion, including a palace that he got as part of his inheritance. View More..
Bhopal, April 20 (IANS) The Election Commission in Madhya Pradesh on Saturday served a notice on BJP's Lok Sabha candidate Sadhvi Pragya Thakur over her controversial remarks about Hemant Karkare, the senior police officer who was martyred in the terrorist attack in Mumbai on November 26, 2008. View More..
Bhopal, April 20 (IANS) Congress leader Digvijaya Singh, who was the Chief Minister of Madhya Pradesh for 10 years, does not own any vehicle, according to an affidavit submitted on Saturday with his nomination papers for the Lok Sabha elections. View More..
Bhopal, April 20 (IANS) Former Madhya Pradesh Chief Minister and senior Congress leader Digvijaya Singh on Saturday filed his nomination papers for the Bhopal Lok Sabha seat. View More..
Bhopal, April 20 (IANS) The Election Commission (EC) on Saturday issued a notice to BJP nominee from Bhopal parliamentary seat Sadhvi Pragya Thakur over her remarks on police officer Hemant Karkare, who was killed in the 26/11 terror attack. View More..
Bhopal, April 20 (IANS) The Bharatiya Janata Party (BJP) on Saturday accused the Congress-led government in Madhya Pradesh of pressurising the district administration to disallow the BJP candidate from the Bhopal Lok Sabha constituency, Sadhvi Pragya Thakur, from organising public meetings. View More..
Bhopal/New Delhi, April 19 (IANS) Two days after joining the BJP and being fielded for Lok Sabha polls, Malegaon bomb blast accused Pragya Singh Thakur on Friday said then Mumbai ATS chief Hemant Karkare had died during the 26/11 terror attack because of her "curse", triggering a major outcry following which she apologized. View More..
Bhopal/New Delhi, April 19 (IANS) Two days after joining the BJP and being fielded for Lok Sabha polls, 2008 Malegaon bomb blast accused Pragya Singh Thakur on Friday said then Mumbai ATS chief Hemant Karkare had died during the 26/11 terror attack because of her "curse", triggering a major outcry following which she apologized. View More..
Bhopal/New Delhi, April 19 (IANS) BJP's Bhopal Lok Sabha candidate Sadhvi Pragya Singh Thakur, who sparked a controversy on Friday by saying that Mumbai ATS chief Hemant Karkare had died during the 26/11 terror attack due to "her curse", apologised for her remark and termed him a "martyr". View More..
Bhopal, April 19 (IANS) BJPs Lok Sabha candidate from Bhopal Pragya Singh Thakur on Friday apologised for her remarks that Mumbai ATS chief Hemant Karkare had died because of her "curse" and described him a martyr. 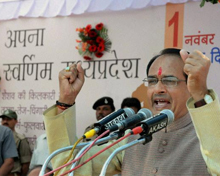 View More..
Bhopal, April 19 (IANS) The Congress on Friday filed a complaint with the Election Commission (EC) alleging that former Madhya Pradesh Chief Minister Shivraj Singh Chouhan asked for votes in the name of the Army during election campaign. View More..